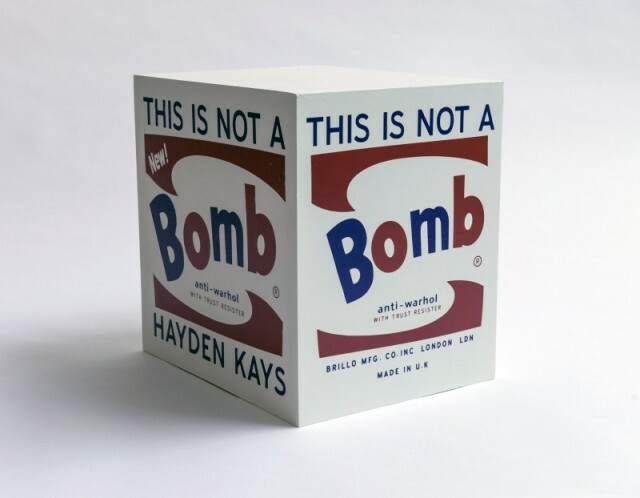 With a practice that encompasses painting, sculpture and printmaking, Hayden Kays has been widely acclaimed as one of the most vital and provocative artists of his generation, producing work that both celebrates and critiques the all-pervasive ‘culture industry’. Kays’s work is characterised by bold imagery, acerbic wordplay, accomplished craftsmanship and deadpan humour. His witty appropriations of everyday references both respond to and subvert the canons set out by 1950s Pop Art and the YBAs of the 1990s. In a world of non-stop livesteams and information economies, where the commercial and the political are simply two notes in the same chord and subversiveness has long been co-opted into the cultural mainstream, Kays’s creations challenge the viewer to question what they see both within the gallery space and in the world outside. Hayden Kays lives and works in Margate, UK. Recent solo exhibitions include Jealous Gallery, London (2016); Exposure, London (2016); Tribeca, Dubai, UAE (2015); Le Blue Note, Paris (2015); Cob Gallery, London (2015); No Walls Gallery, Brighton, UK (2013). He has also featured in numerous group exhibitions such as ‘Proud Collector Banksy and Warhol Collection’, The Grand, Berlin (2017); ‘Teenage Cancer Trust’, Los Angeles (2016); The Space, Hong Kong (2014); Art Car Boot, London (2014); Choisi Cultural Association, Lugano, Switzerland (2014); Moments In Love, ICA, London (2013), Saatchi Gallery, London (2013). Kays was honoured to exhibit his take on the classic design of a Stormtrooper helmet in the fundraising group exhibition Art Wars at the Saatchi Gallery during Frieze London in 2013. This show included works by David Bailey, Damien Hirst and Yinka Shonibare. In 2016, Kays was asked to create the logo for international charity Help Refugees. Kays has been guest editor of the Arts & Culture section of Hunger magazine and has recently featured in TIRADE. His work hangs alongside Banksy and Sir Peter Blake on the walls of The Groucho Club as part of their permanent collection, and his first book, ‘Hayden Kays is an Artist’ was published and launched at the Freud Museum in 2013. A selected collection of work from his career to date, this volume has been declared ‘a seriously good-looking book’ by Banksy.